Acer’s Chromebook 14 is the Chromebook you buy when you want something better than the typical, $200-ish browser laptop, but you’re not quite flush enough to afford the swankier Dell Chromebook 13 or the upcoming HP Chromebook 13. For a midrange price ($299 on Amazon), the Acer Chromebook 14 gives you an all-aluminum chassis and a very nice display, even if its performance and other attributes are less remarkable. 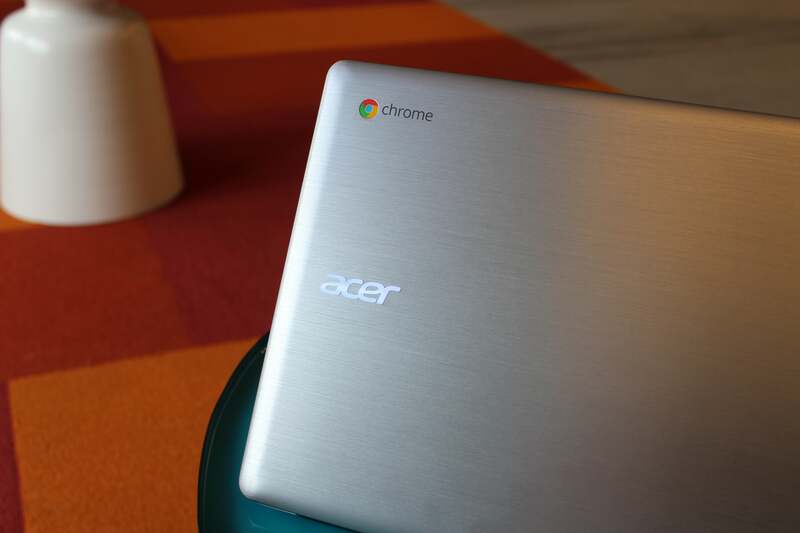 The Chromebook 14 is Acer’s first all-aluminum model, with a brushed finish. Acer touts the all-aluminum chassis on the Chromebook 14, and for good reason. Amid a pile of plastic competitors, the brushed-metal shell looks refined and feels great. 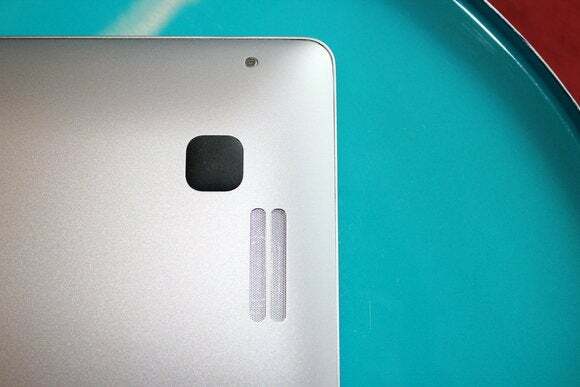 Of course, the material is also durable and light, making the Chromebook 14 a comfortable 3.42 pounds by Acer’s specification. The AC adapter (the typical black brick) and cables weigh an additional 0.55 pounds. The laptop’s dimensions are a trim 13.3 x 9.31 x 0.67 inches. Encased within the lid’s slender bezel is an impressive 14-inch, 1920×1080 LED-backlit IPS display. Chromebooks have a reputation for mediocre screens, with limited brightness and viewing angles. Most have a resolution of just 1366×768, which suffices on an 11-inch display but starts to look ridiculous when stretched over a 14-inch display. The Acer Chromebook 14’s screen looks crisp and has a good maximum brightness (236 nits by our measurement). The 170-degree viewing angle means it’s readable from all sides, and the anti-glare coating is another big plus. 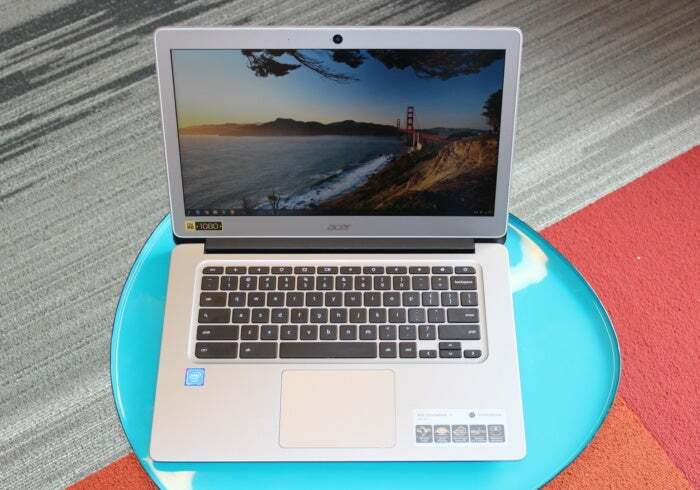 The Chromebook 14 has a 1920×1080 IPS display with 170-degree viewing angles. A higher-resolution display does use more battery. 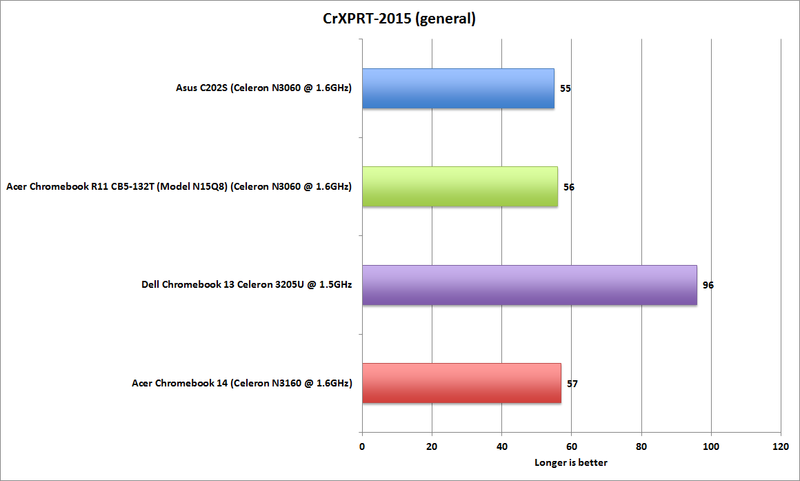 We logged 8.82 hours of life from the Chromebook 14’s 3-cell, 3950mAh pack, using Cr-XPRT 2015’s benchmark. That’s a good amount of time, though not as long as Acer’s promise of up to 12 hours. I never expect to like a laptop’s speakers, which is why the Acer Chromebook 14’s deserve mention for being surprisingly good. The dual set, nestled underneath the left and right sides, provide good bass and stereo effects. You might still plug in external headphones, but at least your laptop won’t sound like a cyber-chipmunk if you have to use its speakers for a presentation. The Acer Chromebook 14 has dual speakers on either side of the bottom panel, with surprisingly good sound. You also can’t argue with the Chromebook 14’s connectivity. It has Bluetooth 4.2 for the latest in close-range performance and privacy. Wi-Fi covers every available flavor with dual-band 2×2 MIMO 802.11ac/a/b/g/n. I don’t mean to seem ungrateful for the Chromebook 14’s good things, but Acer appears to have bet everything on those features, meaning the rest of the Chromebook is less remarkable. Anyone whose expectations were raised by the high-end look may be at least a little disappointed. The chiclet-style keyboard on the Acer Chromebook 14 has hard plastic and a harsh travel. There’s also a large clickpad. I was particularly unhappy with the keyboard, which has the hard-plastic keys and harsh, abrupt travel typical of entry-level Chromebooks—not what the Chromebook 14 is supposed to be. The large clickpad worked well. 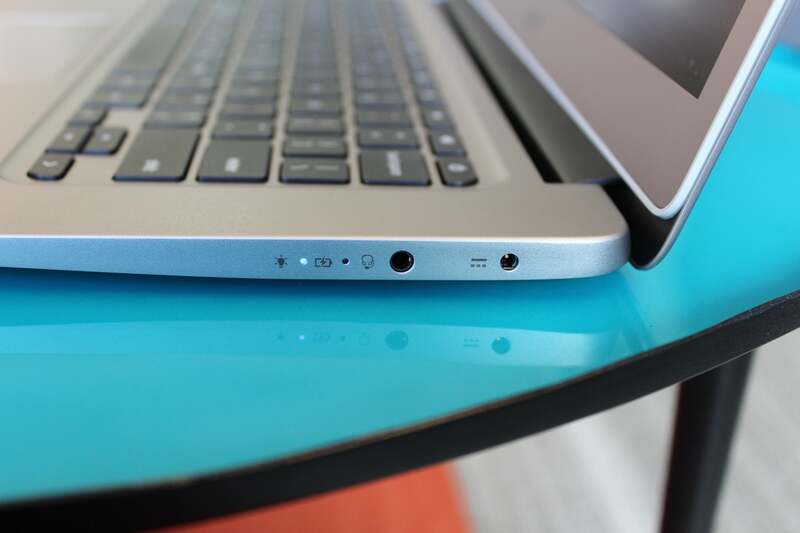 The right side of the Acer Chromebook 14 has the headphone/mic jack and power port. 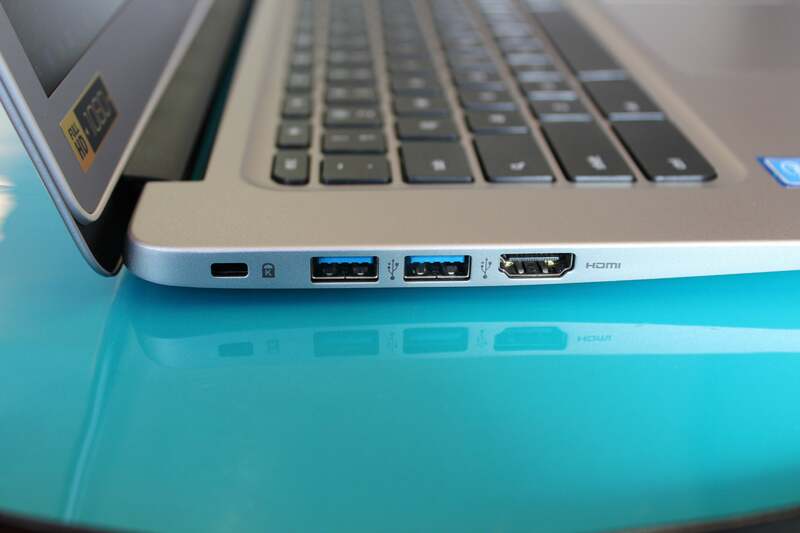 Direct connectivity is limited to just two USB 3.0 ports (first-generation, meaning a 5Gbps transfer rate) and an HDMI port. While the 32GB of eMMC storage is nice, I think a lot of users will miss an SD card slot—there’s none on this machine. The left side of the Acer Chromebook 14 has two USB 3.0 ports, an HDMI port, and a Kensington lock port. The Chromebook 14’s performance reflects its modest SoC: Intel’s Celeron N3160 quad-core running at 1.6GHz, with 4GB of LPDDR3 RAM and integrated Intel HD graphics. This setup will make it through mainstream web apps and a streamed movie—which is what most people with Chromebooks do—but this isn’t the Chromebook for bleeding-edge users tinkering with web gaming or other graphics-intensive tasks. Anecdotally, even running multiple media-heavy sites simultaneously seemed to strain the Chromebook 14, so keep it simple. 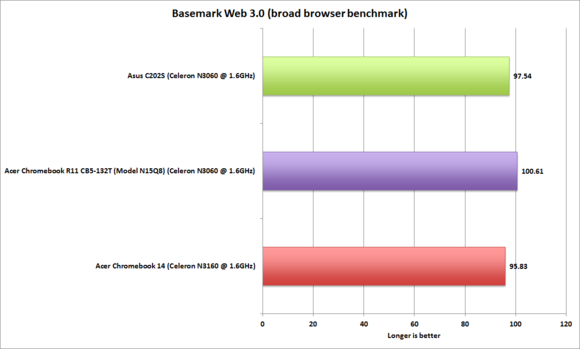 Because this is the first N3160-equipped Chromebook we’ve tested, we compared it with some recent N3060-based models, which are of the same Braswell generation, but with two cores instead of four. 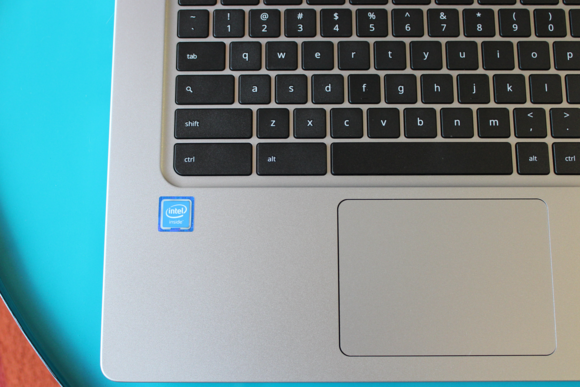 We also included the Dell Chromebook 13, which has a Celeron 3205U instead of an SoC, so you can see how a higher-end (and higher-priced) Chromebook compares. The Chromebook 14 (red bar in each chart) started off well with the Cr-XPRT performance test, which measures Chromebook performance in basic productivity tasks as well as more demanding activities, such as watching movies or playing games. It’s in the lead, if by a hair, compared to the other two low-end Chromebooks. Not surprisingly, though, the Dell smokes everyone. 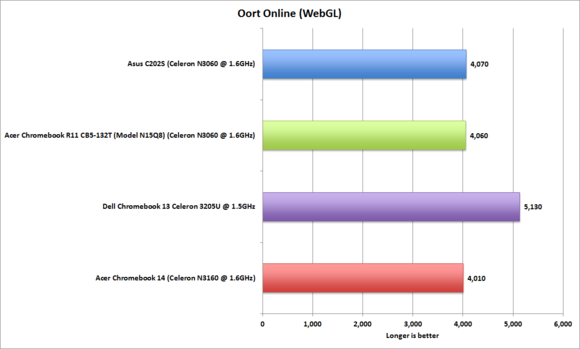 As if to drive home the Chromebook 14’s mainstream theme, here’s how it fared on OortOnline, a WebGL test that focuses on graphics-intensive applications and games. 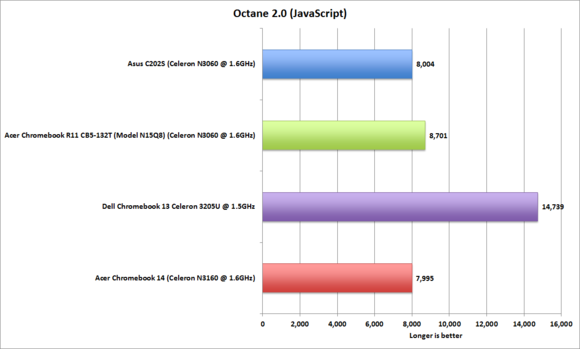 Even though it has a more powerful SoC than the two other Chromebooks (excepting the standout Dell), it posted the lowest score by a small margin. 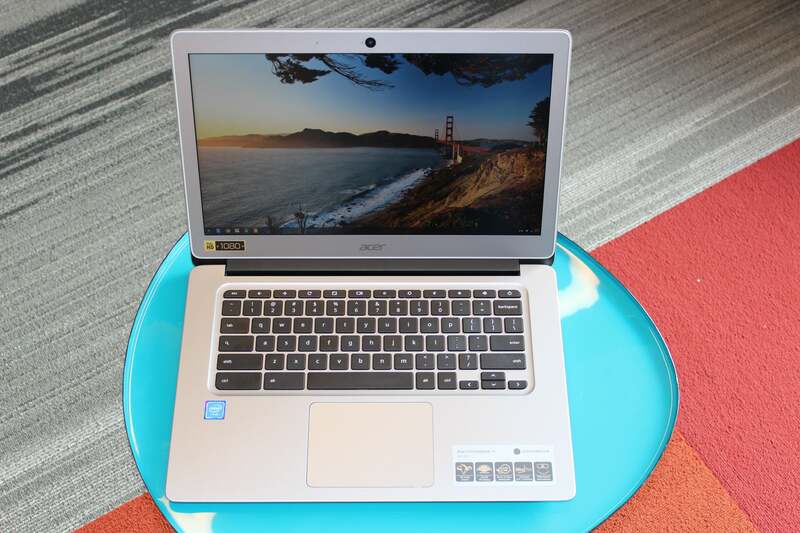 Acer’s Chromebook 14 is about look and feel. The aluminum shell and high-resolution display do a lot to separate it from its lower-cost cousins and give you a better experience. You’re already paying a little more just for those two perks. It’d cost you even more to get better performance and features, but for mainstream users, the Chromebook 14 represents a fairly sweet spot.